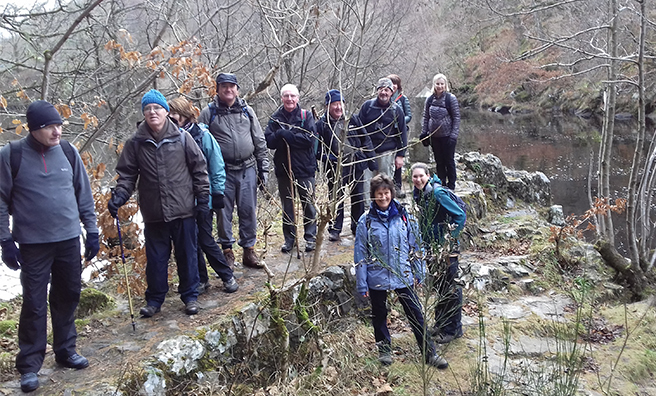 Our group usually meets for four hikes a year but we decided to get together a bit earlier this year for a wee ramble to shake of the winter cobwebs. After the deluge on our last hike in the Ochils we were relieved to find the weather fair and clear in Pitlochry – if a little chilly. 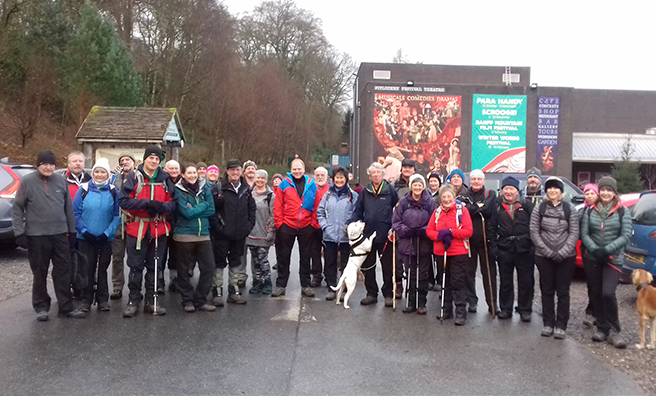 Thirty three of us met at the Pitlochry Festival Theatre car park (fantastic venue, by the way) and took the path past Fonab Castle towards the hydro-electric dam which created Loch Faskally. Steps beside the dam lead us along the salmon ladder, created to allow salmon to bypass the dam on their journey upriver. 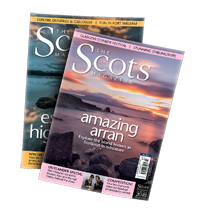 The ladder was the first of its kind in Scotland and makes for a fascinating visit in salmon breeding season when you can watch them jumping. 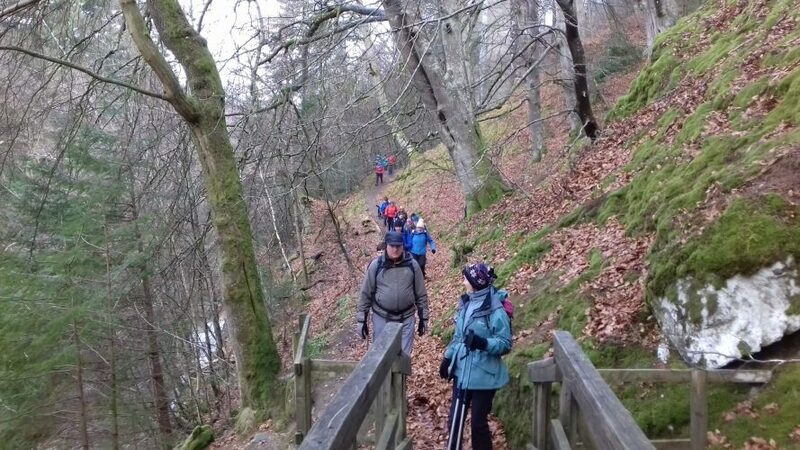 Alas, in early January there are no salmon to be seen so we kept going along a meandering path round Loch Faskally and the River Tummel, where keen eyes spotted roe deer on the wooded banks. 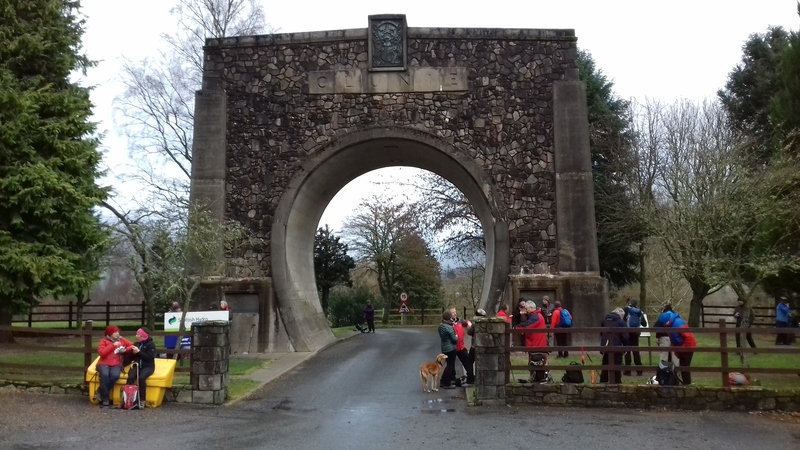 We stopped for a tea break to admire the Clunie Memorial Arch, erected in memory of five men who lost their lives digging out the Clunie tunnel – part of the Tummel hydro-electric scheme. Lunch was a fine affair. 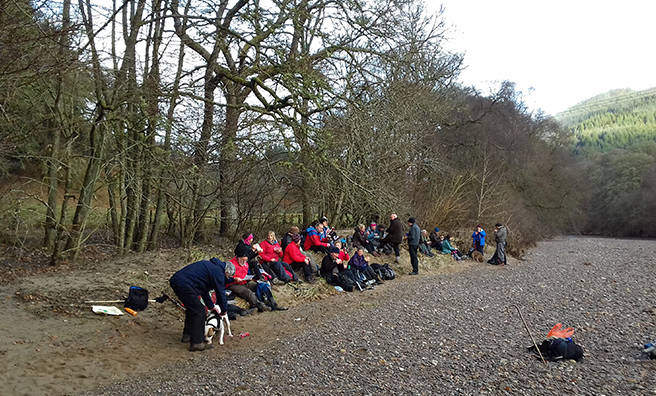 The fog that had plagued so many of us on the drive to Pitlochry had lifted, and we sat on a sandy beach to eat our pieces, and watch our canine hike group members play in the river. 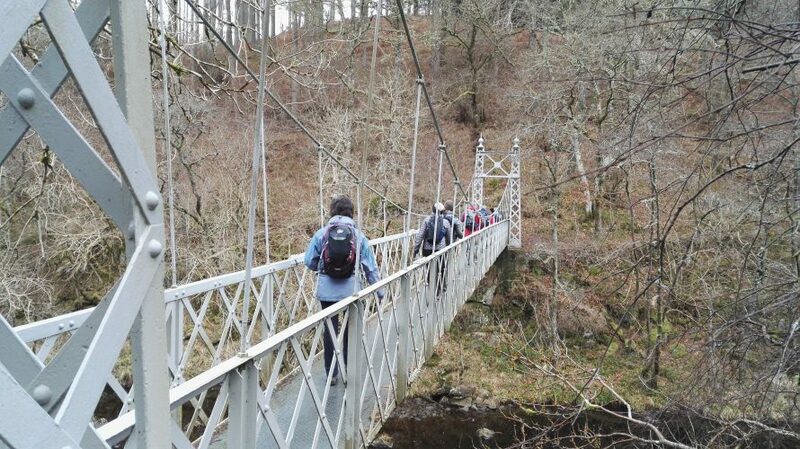 Further upriver we paused to watch one brave lass take on the Highland Fling bungee jump off the Garry Bridge before we headed north to cross the smaller Garry footbridge – traffic and bungee-free. 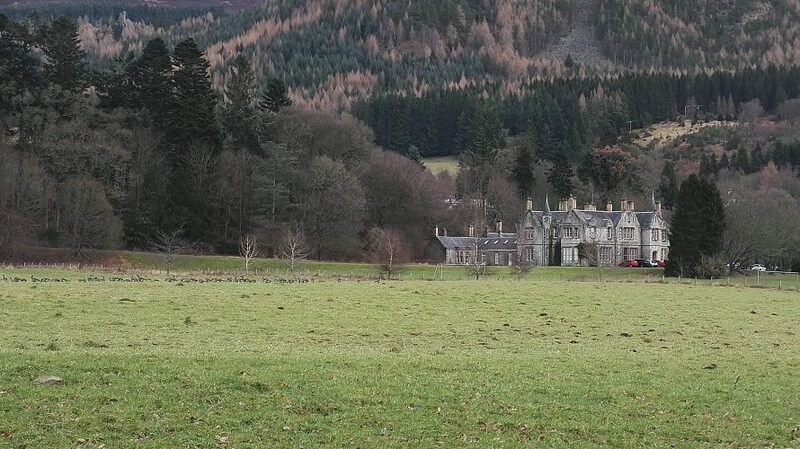 On our journey back south we were treated to another interesting sight – a large gaggle of Canada geese wintering in the fields in front of the 19th-century Faskally House. 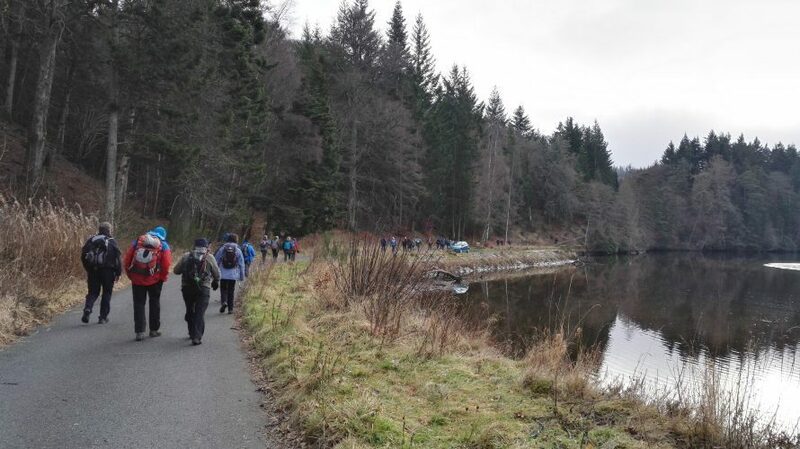 A few more miles through Enchanted Forest country and we were back by the Tummel and nearing the car park again. 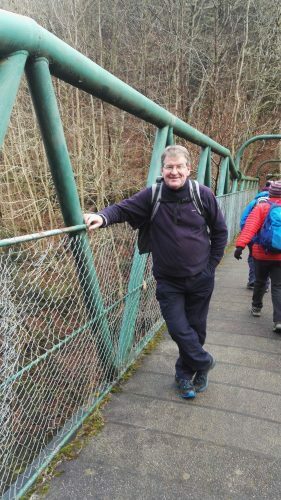 After our nine-mile walk, refreshments were in order, so we headed up to another grand Pitlochy building, the Atholl Palace Hotel, where we felt a little underdressed in our hiking gear, but were made to feel welcome! It was a great day out – and a good start to 2017. 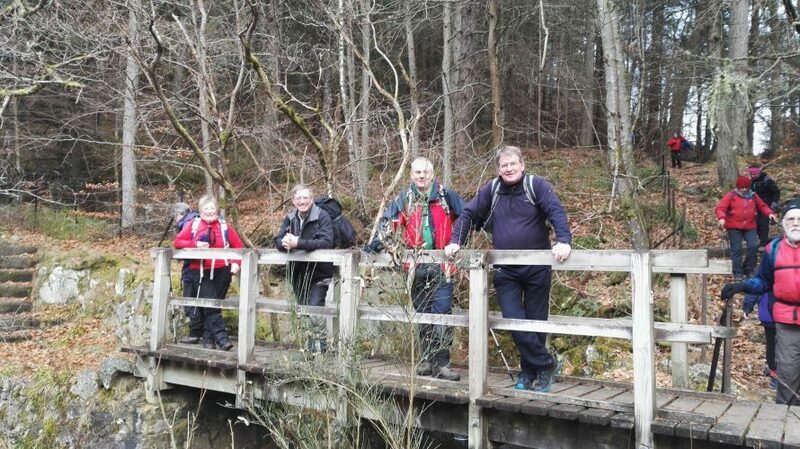 We have four more hikes planned this year – would you like to join us on our next one? Go to the Take A Hike homepage to find out upcoming dates. 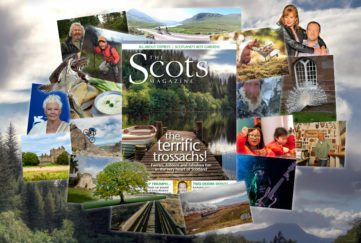 Liz, Alan, Anthony and Garry enjoy a wee break. 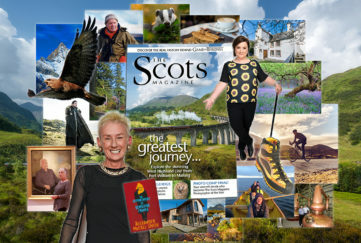 Lorna and Gordon lead the way! Oor Garry on his bridge. Can you spot the Canada geese in the foreground?